AJAX TICKETS SEASON 2018/2019. 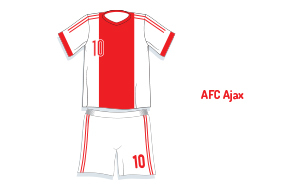 Ajax is Holland's most successful football club and known for their attractive and attacking football. 1st4FootballTickets sells Ajax tickets for home and away matches. Buy Ajax tickets and all other tickets to watch football in Holland, the UK and throughout Europe. The most popular Ajax tickets are Ajax vs Feyenoord tickets, Ajax vs PSV tickets and Ajax vs AZ tickets. Ajax stadium address: Amsterdam Arena. Amsterdam, The Netherlands - Capacity: 51400 seats. 1st4 Football Tickets provides Ajax tickets for Dutch Eredivisie and Champions League games. Buy Ajax football tickets, premium or hard-to-get Barclaycard Premiership tickets, Champions League tickets, World Cup Tickets, English FA Cup tickets, UEFA Europa League tickets and all other football tickets in the Netherlands and throughout the world.